Share and Care | Summit Wealth Management, Inc.
Riders, Doug is second from right. 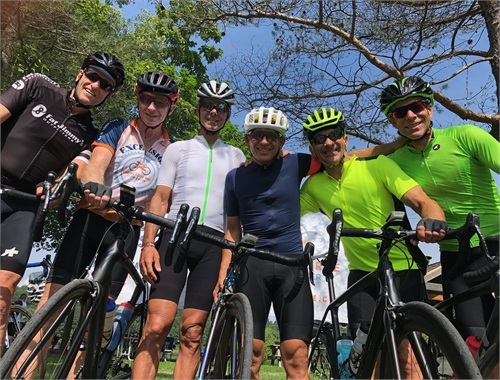 Doug Schutte, President of Summit Wealth Management, has just completed the Empire State Ride to End Cancer across New York State. Riding for the Roswell Park Cancer Institute in Buffalo, Doug raised $3,850 toward this important cause. 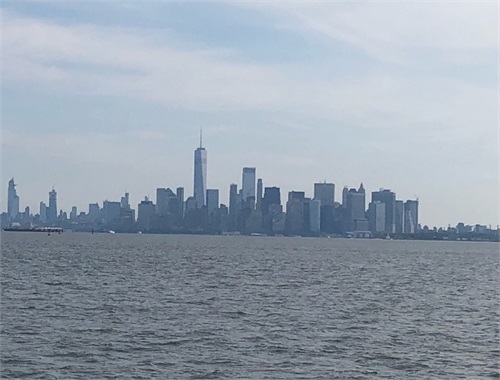 The seven day (July 29- August 4), 500+ miles journey started in New York City, traveled through some of the most scenic parts of New York State and ended at one of the natural wonders of the world, Niagara Falls. The route was fully supported by Empire State Ride staff to ensure the safety and success of all riders. Everyone rode at their own pace and shuttles were available to assist cyclists. 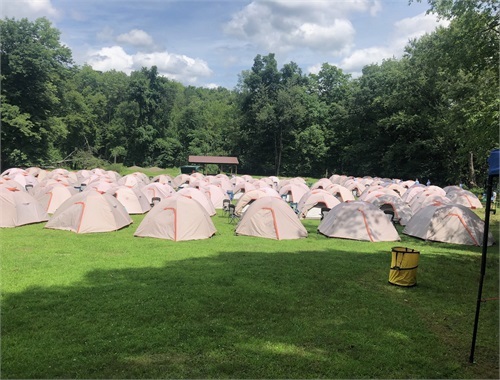 Participants were provided tent camping accommodations every night complete with air mattress. Empire State Ride staff set up and took down these “tent cities” each day, and all riders’ luggage was transported from campsite to campsite. Also provided was an all-important charging station for phones and GPS devices, and mechanics were on-site at camp to make sure bikes were ready for the next day. The offices of Summit Wealth Management, Inc. held National Day of Giving events at their locations in Jamestown and Fredonia on Thursday, November 28. 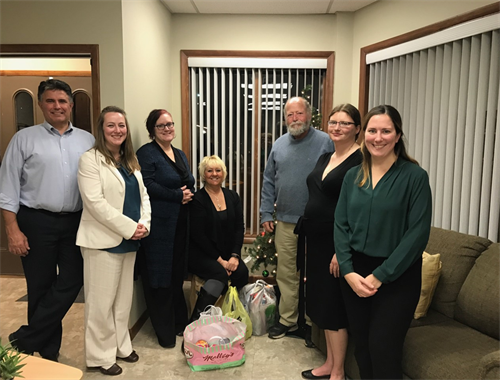 The focus was to give thanks to their clients and community with a holiday party and provide donations to two local charities. 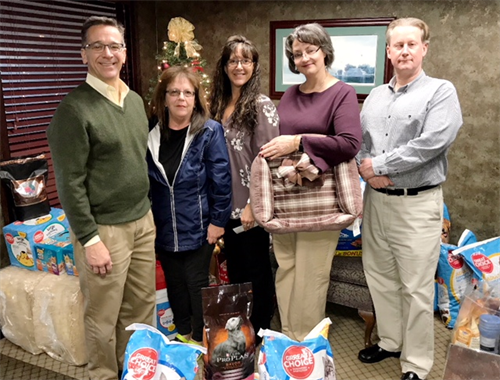 The Fredonia office collected and donated items to Chautauqua County Rural Ministry in Dunkirk, and the Jamestown office chose Dawn’s Canine Rescue in Falconer. Summit Wealth Management, Inc. would like to thank their clients for their donations and wish all a happy holiday season. Luke Buehler and Summit Wealth Management are sponsoring the 10th Anniversary of the Canadaway Creek Conservation Project! We are having the 10th Anniversary of the Canadaway Creek Conservation Project!! 11:30 am- Meet at gazebo behind the Fredonia Fire Hall on Main Street in Fredonia by the stream to sign-up, distribute maps of Canadaway Creek, participate in cook-out and select designate clean-up and planting sections. 1 pm - Move to designated sections and begin clean-up, remove invasive species and planting willow or dogwood whips. 3- 3:30 pm - return to Gazebo behind Fire Hall - for a celebratory group get-together and cake. The event, which includes a stream clean-up, tree planting and invasive plant species removal, has continued to grow and we now get around 200 participants. The event is organized by SAREP/4H Youth Fly Fishing Program which is into its seventeenth year of community service. The project will include an educational presentation, a stream clean-up, invasive species removal and tree planting activities that have been set up to nurture and protect our local stream, Canadaway Creek. Free lunch, caps, t-shirts and cake will be provided to all participants. We encourage participants to bring felt bottom boots (if available) or other shoes that can be used for wet wading. Children must be accompanied by a parent. S.A.R.E.P. 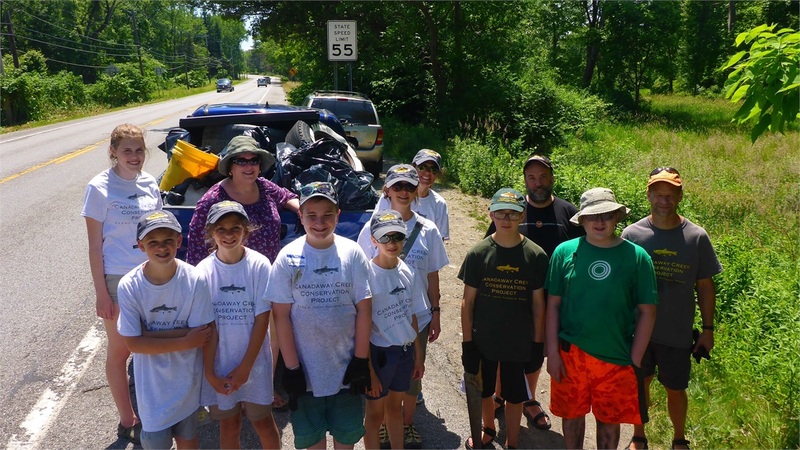 Youth Flyfishing Program is a not-for-profit volunteer educational program that, for the past 15 years, has been providing children with information and experiences related to aquatic resources, conservation, ethics, and flyfishing. The ethics of the program promotes "catch and release" as well as respect for fellow fisherman/woman and the land on which they fish. It is the goal of the program to protect the local species and the land for future generations. Our program closely ties together the importance of understanding nature with the rewarding act of flyfishing. The program meets every Monday from 7-8:30pm from October through early June at the Fredonia Central Middle School Cafeteria. It also periodically provides kids and community members with fly fishing field trips on Canadaway Creek. Participants can join at any time during the year. S.A.R.E.P. Youth Flyfishing Program works with the Cornell Cooperative, local schools and community groups. There is no cost to participate in this program. The stream was originally settled by the Erie tribes and later by the Iroquois who called the stream “Ga-na-da-wa-o”, meaning “running through hemlocks”. The early European settlers from Eastern and Central Pennsylvania ended up pronouncing the name as “Canadaway”. The Native American name probably referred to the dense canopy that still covers the deep gorge at its headwaters. Early surveyors named the creek “Cascade” after the scenic falls that are located in the town of Arkwright. The first non-native settlement along its banks occurred on 1804 and was called Canadaway. This settlement later became the village of Fredonia. The mouth of Canadaway hosted the first naval battle in the War of 1812 where an American military company held off a British gunboat as it tried to seize a salt boat from Buffalo that had sought sanctuary in the creek. As the area became populated and settlements prospered along the stream, two preservations were created to protect the creek’s natural resources. The first is the 33-acre Canadaway Creek Preserve (now owned by New York State) is located at the mouth of the stream and is on a major flyway for migrating birds. During the fall and spring migration, the sanctuary protects around 140 species of birds. The second preserve is the Canadaway Creek Wildlife Management Area, which is located on a 2,180-acre tract of land that protects the headwaters. Its dense hardwood forest provides the nesting areas for a large variety of birds including the Yellow-bellied Sapsucker and Great Blue Heron. The SAREP/4H Youth Fly Fishing Program has spent the last 5 years try to restore the native brook trout population in this part of the stream. Due to their efforts the stream has seen brook trout in its waters for the first time in a century. Canadaway Creek is now one of the most productive streams for steelhead fishing in the country and is a significant contributor to tourism dollars in the region. Canadaway Creek is a beautiful little gem in the Western New York area and the SAREP/4H Youth Fly Fishing Program would like to restore, nurture and preserve its natural resources for future generations. The Chautauqua Watershed Conservancy is inviting sportsmen and women in the area to celebrate a major milestone in their conservation efforts. The CWC has rescued 1000 acres of wildlife habitat in Chautauqua County and that land is now open to the public at no cost. With a focus on land conservation and watershed education, the CWC has been dedicated to preserving and enhancing the water quality, scenic beauty and ecological health of the lakes, streams and watersheds of the Chautauqua region since 1990. Orvis representatives from their store at the Eastern Hills Mall in Williamsville, NY will be traveling to the Northern Chautauqua Conservation Club to present an unique one hour Fly Fishing 101: Introduction to Fly Fishing Course from 4-5 pm. There is no charge for the course but participants need to arrive at 3:30pm. Food and refreshments will be presented between 5-5:30 pm. At 5:30, a short educational presentation on duck hunting will be presented by John Michalovic. Mr. Michalovic is not only a former President of the Finger Lakes & Western New York Waterfowl Association but he has also served as New York State Chairman and Treasurer for Ducks Unlimited and has been a respected NYSDEC-certified Waterfowl ED/ID instructor for almost 40 years. Internships are a crucial piece of framework for molding business professionals. It’s important for students to gain knowledge and work experience before entering the work force. 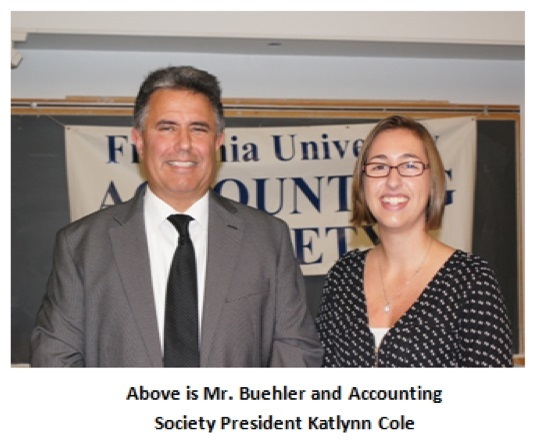 Fredonia State’s Accounting Society hosts local business professionals to come in and give professional advice to students looking to gain knowledge and skills to succeed. On October 5, 2016 Luke Buehler was requested to come speak to young business students looking to pursue internships and work experience. As, a business owner Mr. Buehler gave both pros and cons of having interns based on his past experiences. From his perspective he made sure to explain how important it is to make yourself stand out. For example, having a strong work ethic and staying goal driven are a couple key factors that can help. He also talked about why some small businesses don’t want interns. Topics such as the costs of adding another person to your staff and the time it takes for proper training made it clear of the adversity you face when seeking an internship. Fredonia’s business students found that Mr. Buehlers presentation was very insightful in how they were able to see an internship position through the eyes of a business owner. The Accounting Society appreciated Mr. Buehler taking time out of his day to come talk about internships. Social media can be a wonderful thing. As in the case of old high school friends coming together to help a fellow classmate. My assistant, Rhonda Frank, became involved in organizing a fund-raising benefit for a dear friend who is battling peritoneal cancer and facing her third round of chemotherapy. At the suggestion of a friend in an online group conversation regarding their ailing friend, the friends decided to give it a go. Even though Rhonda had never been involved in organizing a benefit, and even after more than 30 years of not seeing some, the classmates rallied together, meeting six or seven times in the 3-month span they had to organize, and pulled together an event that surpassed their wildest dreams! People from everywhere donated numerous items for both the Chinese auction and live auction held at the local fire hall, preceded by a golf scramble nearby. Spaghetti dinner with all the fixins, live DJ and a big 50/50 drawing rounded up the festivities. The winner of the 50/50 donated their winnings back to the cause, and all in all, everything turned out very well for Rhonda’s dear friend. Rhonda worked many hours in her personal time to help a friend in need, and with a group of like-minded people, created something great for another person. This is the essence of life and love.